After making four all live action films in Britain, Walt Disney had proven to audiences that he wasn't just an animation producer. With some credibility under his belt, he decided to put a lot of money into a big production and four his source material, he chose Jules Verne's classic novel, 20,000 Leagues Under the Sea. It was Disney's first science fiction film, and the only one to be produced during Walt's lifetime. Since this was such a big budget production, Walt cast big name stars in the lead roles. Kirk Douglas plays the film's hero, Ned Land. Paul Lukas and Peter Lorre were cast as Professor Aronax and Consiel. And for the film's villain, Captain Nemo, Walt cast James Mason. It surprised many when Walt hired Richard Fleischer to direct the film, who was the son of Max Fleischer, a leading cartoon maker who was one of Disney's biggest competitors in Hollywood. A new soundstage was built at the Disney Studio with an underwater tank. In addition, Walt paid to use the backlot at Universal and a water tank at Fox and beyond that, there was a lot of location shooting in Jamaica and the Bahamas. 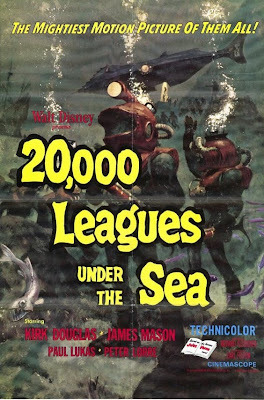 20,000 Leagues Under the Sea was the first Disney film made in the new widescreen CinemaScope. Prior to this, all Disney films were made in academy ratio (1.37:1 fullscreen). Since CinemaScope was so new, Disney was only allowed one lens, which caused production to last much longer than it normally would have. It was one of the first CinemaScope films ever made outside of 20th Century Fox. Harper Goff was responsible for the art direction, in particular designing and building the Nautilus. The attack of the giant squid sequence had to be reshot. The book described the attack as taking place at sunset on a calm sea, but when the film was played back the wires on the squid were visible and looked fake. The scene was rewritten to take place at night during a storm and the scene was filmed again with satisfying results. The film takes place in 1868 as ships are supposedly being sunk by a sea monster. Professor Aronax and Conseil are traveling on an expedition to find the sea monster where they make friends with harpooner Ned Land. On the mission, their ship is attacked by the monster and the only survivors are Ned, Conseil and Aronax. At sea, they stumble upon the monster, which turns out to be a submarine. They try to escape as the crew rushes after them, but are taken prisoner where they meet Captain Nemo. Ned and the Conseil become part of the crew as Aronax is treated as Nemo's guest. When Nemo shows Aronax the engine room, he is shocked to find that the ship uses nuclear power, which the rest of the world has yet to discover. Nemo was once a slave forced to make ammunition for wars and now seeks revenge against the armys that he sees as destroying the world. A war ship finds the Nautilus stuck in a reef and attacks, causing it to lose power and sink. Nemo and his crew get the power back on, but they have now sunk to 20,000 leagues and a giant squid grabs hold of the Nautilus. Their only choice is to rise to the surface and fight the beast off and a suspenseful battle ensues. Ned is able to harpoon the beast and saves Captain Nemo in the process. Upon reaching the island of Volcania, Nemo's headquarters, warships have him surrounded. Nemo goes to shore to set a nuclear bomb to destroy his discoveries and on his way back to the Nautilus, he is shot in the back. He takes his ship down for the last time and informs the crew that they are about to die. Ned puts up a fight, gets past the crew and brings the ship back to the surface. Ned, Aronax and Conseil escape in the lifeboat as Volcania is destroyed and the Nautilus sinks. Walt Disney's 20,000 Leagues Under the Sea premiered on December 23, 1954. Critics loved the film and showered it with praise. Audiences were quick to discover its brilliance and it was a big success. It won two Academy Awards for art direction and visual effects and was also nominated for best film editing. Walt Disney Pictures attempted to make a prequel in 2009 that was to be directed by McG and would star Will Smith as Captain Nemo, but when Rich Ross took over as president of the studio, he decided to cancel the production. This is probably for the best, as it would be impossible to even come close to topping the excellence of the original. 20,000 Leagues Under the Sea is one of Disney's best and most iconic live action films. As a kid I hated it. There are several parts of the film designed to appeal to kids, such as the Nautilus' sea lion, Esmeralda, but in general the film appeals to adults and is too slow and complicated for kids. I discovered how amazing the film truly is when I was in my teens and it has been one of my favorite films ever since. Of all the film versions of Jules Verne's classic novel, Disney's is considered the best and is the most well known as well. I was shocked to find that the score wasn't nominated for an Academy Award, as it is very memorable. The single song from the film, "A Whale of a Tale," has become a Disney classic, frequently found on compilation albums and referenced in Pixar's Finding Nemo. By the way, the titular clown fish from that film was named after Captain Nemo. The film has been the inspiration for several Disney theme park attractions through the years. When Disneyland opened in 1955, guests could tour sets from the film in Tomorrowland, which included an encounter with the giant squid from the film. That attraction closed in 1966. In 1969, the pipe organ from the film was reused in Disneyland's The Haunted Mansion, where it can still be seen today. When the Magic Kingdom at Walt Disney World opened in 1971, it had an attraction called 20,000 Leagues Under the Sea Submarine Voyage in which guests rode under water in the Nautilus and came face to face with the giant squid. That attraction closed in 1994. Two attractions based on the film still remain. A dark ride can be found at Disney Seas at the Tokyo Disneyland Resort and a walk through exhibit is in Tomorrowland at Disneyland Paris. 20,000 Leagues Under the Sea is currently available on DVD in a 2-disc Special Edition. The film has been fully restored to its original brilliance and the set is packed with great bonus features, including an audio commentary, making of documentary, and the original attack of the giant squid scene. It is also available on iTunes in widescreen, where it is available in HD. However the digital copy doesn't include any bonus features. I recorded this film last night and will watch it this evening-looking forward to it! I was born exactly one year after the film's release; I didn't get to see it until the '71 're-release, but I've seen it many times since, and count it as one of my favorite movies.